Growing up, we would head north to visit my grandparents and squeeze in their house with the rest of the extended family. When I say squeeze, I really mean it. I'm sure we had upwards of 20 people staying in that house some years. With one shower. Let me tell you how fun that was. Or how many not-so-hot showers I had. 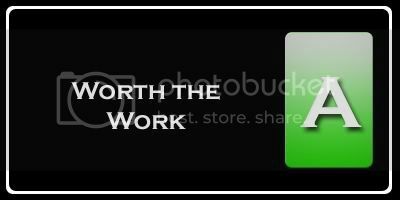 In the end though it was always worth it. We got to see our aunts and uncles and cousins that we only saw once, maybe twice, a year. Every year we would always have two huge Christmas dinners, one on Christmas Eve, the other on Christmas. One night would be turkey, the other night would be ham. There was always your typical "feast" sides -- green bean casserole, broccoli casserole, corn, mashed potatoes, sweet potatoes, pretty much you name it, we had it. Oh and the rolls, you most definitely can't forget the rolls. I would always munch on one as I was filling my plate and then quickly go back for another. There's something about warm fluffy rolls that makes me happy. Instead of cracking open the can for crescent rolls this year at Thanksgiving, I decided to try my hand at making my own. 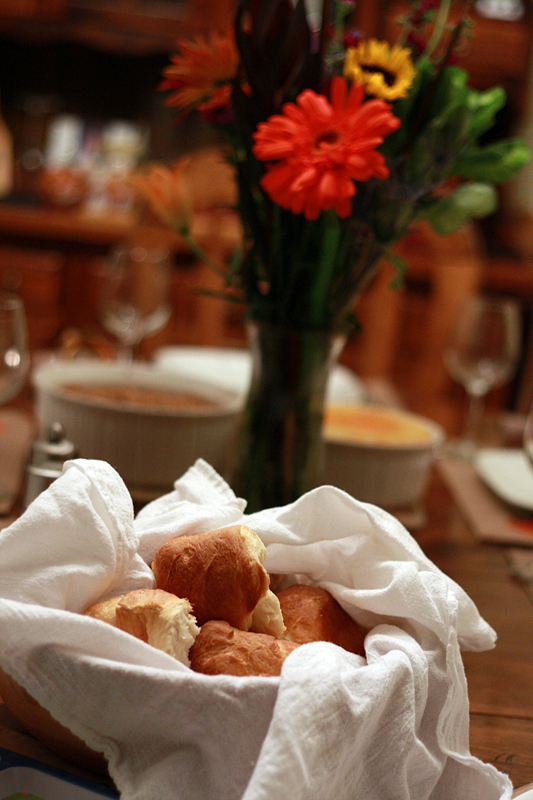 Although the dough tried multiple times to pull a Houdini act out of my mixer, it was totally worth the extra work to have fresh homemade rolls on the table. These will definitely be making more appearances at any holiday table in the future. In the work bowl of a mixer, combine the yeast, warm water, and honey. Allow to rest for about 5 minutes. Add the oil, salt, and egg and mix well with the paddle attachment. Slowly add in 3 cups of the flour (still with the paddle attachment) and mix until a stick dough forms. Switch to the dough hook and slowly mix in the remaining cup of flour. Remaining at low speed, knead the dough for about 8 minutes, or until smooth and elastic. Meanwhile, lightly oil a large bowl. Once the dough has finished kneading, transfer to the oiled bowl, turning once to coat. Cover bowl with plastic wrap and allow dough to rise in a warm, draft-free spot until doubled in size, about 2 hours. Once the dough has doubled in size, turn out onto a lightly floured surface and knead for about 30 seconds. Cover with a towel and allow to rest for 10 minutes. Remove the towel and punch the down down. Divide dough into 10-12 equal pieces and form each into a ball. Coat a 9 x 13-inch baking dish with cooking spray. Place dough balls evenly spaced into the dish. Cover with a towel and allow to rise in a warm, draft-free area for 20-30 minutes. In a small bowl, mix together the butter and honey. Brush the tops of the rolls with the butter mixture (after they have risen). 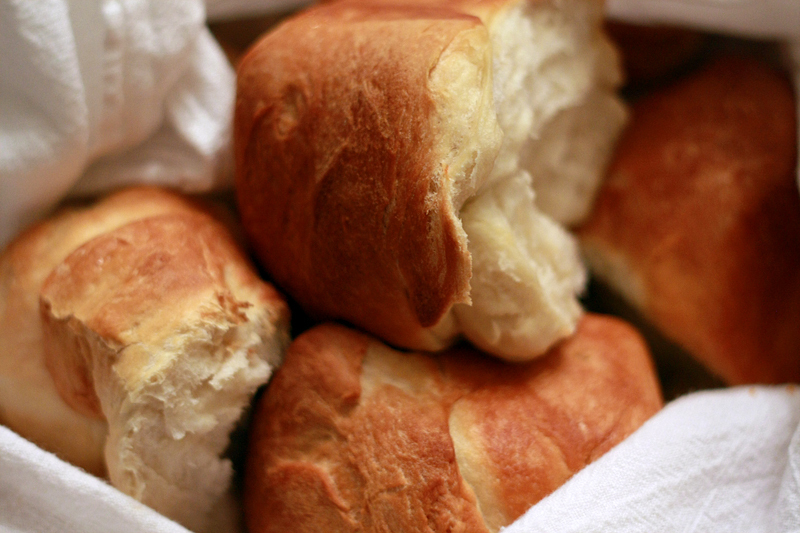 Bake for 22-30 minutes, or until the tops are golden brown and the rolls are baked through. Let cool slightly before serving. We all loved how the honey flavor in these rolls really came through. I actually ended up dividing the dough into only 9 rolls as we were limited on baking dishes, and they turned out absolutely monstrous! Amazing, but huge. They were also a little on the dense side, but I think that squishing all that dough into a little pan probably had something to do with it. We also discovered that Michael is taking after his aunt, only being coaxed into eating the rest of his food with promises of more bread. "More roll please!" This looks so nicely browned and fluffy. I like the addition of honey 'cause I like sweet rolls. Those are so pretty. I love fresh baked bread of any sort! Those look so delicious! I get tired of the same old crescent rolls from a can. Wow you did an amazing job with making these rolls. They look so light and fluffy. Mmmm I love the addition of the honey in the recipe, they sounds sooo good! I love me some honey. These look amazing! They look amazing, I am seriously impressed. Great photos too! I'm in love with the crust of these honey rolls. I haven't made bread in too long. I need to put remedy to it. Fantastic job on these rolls! Yummy! 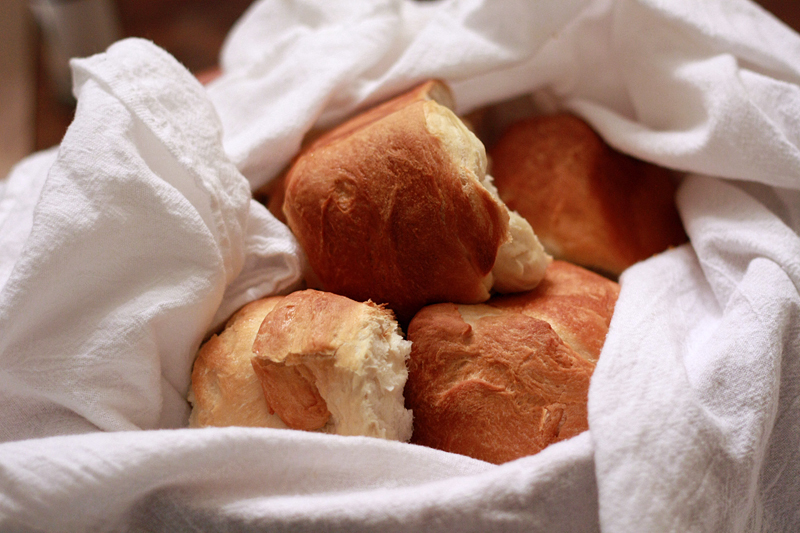 I just had toast for breakfast, and that does NOT beat these yeast rolls with honey! I need a warm one now!